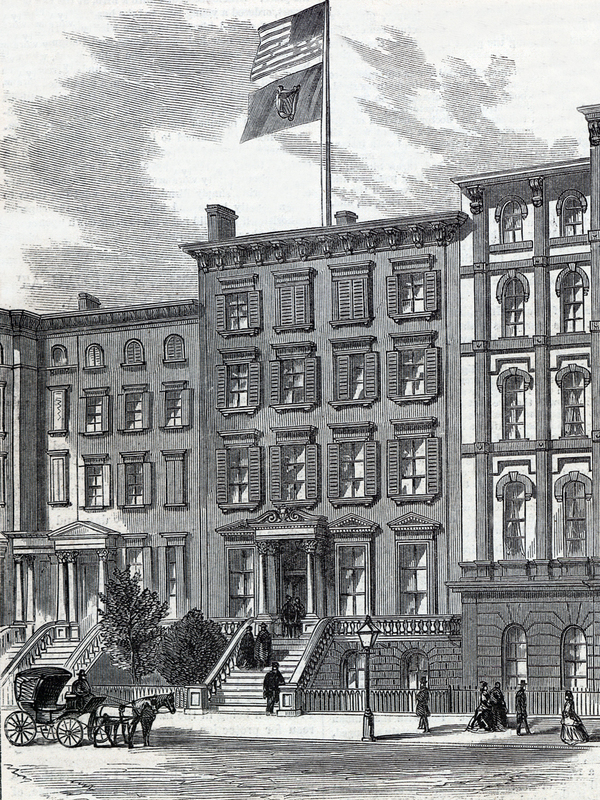 In the latter half of 1865, the Fenian Brotherhood of America (FBA), the formerly clandestine Irish revolutionary organisation in the United States and Canada, spent the modern equivalent of some $3.5 million dollars on moving its headquarters from a modest address at 22 Duane Street, New York City, to a prestige location at Moffat Mansion, 32 East 17th Street, Union Square, Manhattan, next to the popular Everett House Hotel. The enormous costs involved in the leasing and outfitting of the substantial brownstone building, owned by a leading Scottish-American doctor called John Moffat, led to much rancour and debate within the movement. 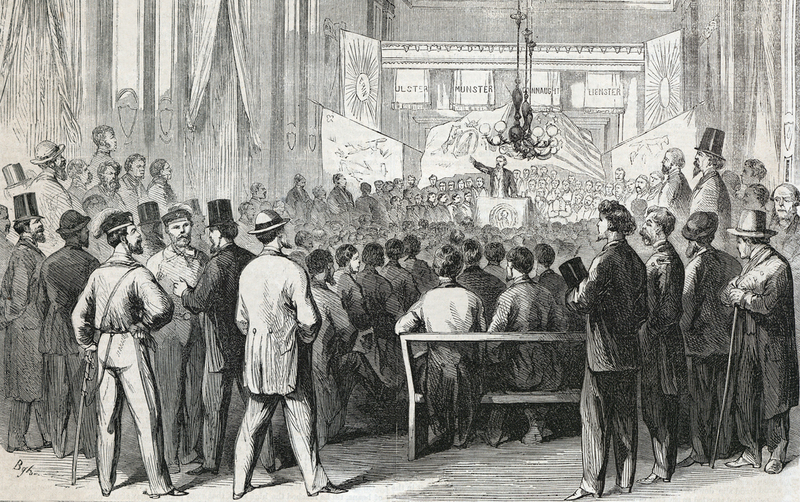 However many in the FBA’s leadership justified the move by pointing to the resolutions of the 3rd General Convention of the Fenian Brotherhood of America, held in October 1865 at the Assembly Building in the city of Philadelphia, Pennsylvania. 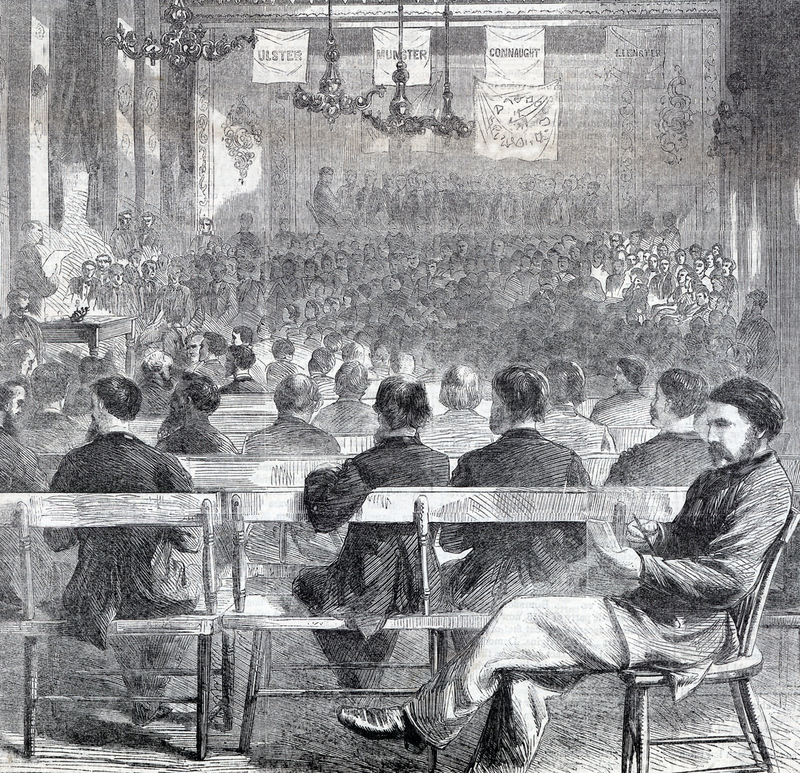 At the annual gathering of six hundred elected Fenian delegates a new constitution had been adopted establishing a “president” and a fifteen-strong “senate” to govern the sprawling organisation, replacing the previous underground titles of “head centre” and “executive”. From November onward the address on the northern side of the busy Union Square was to become the administrative seat of the “Provisional Government of the Irish Republic in Exile” with John Francis O’Mahony, a noted scholar and former US army colonel, as its first president. Depressingly, within weeks of the headquarters’ formal opening the movement would split into two broad camps, the main causes being a procedural row over the issuing of “national bonds” and the future direction of the grouping. 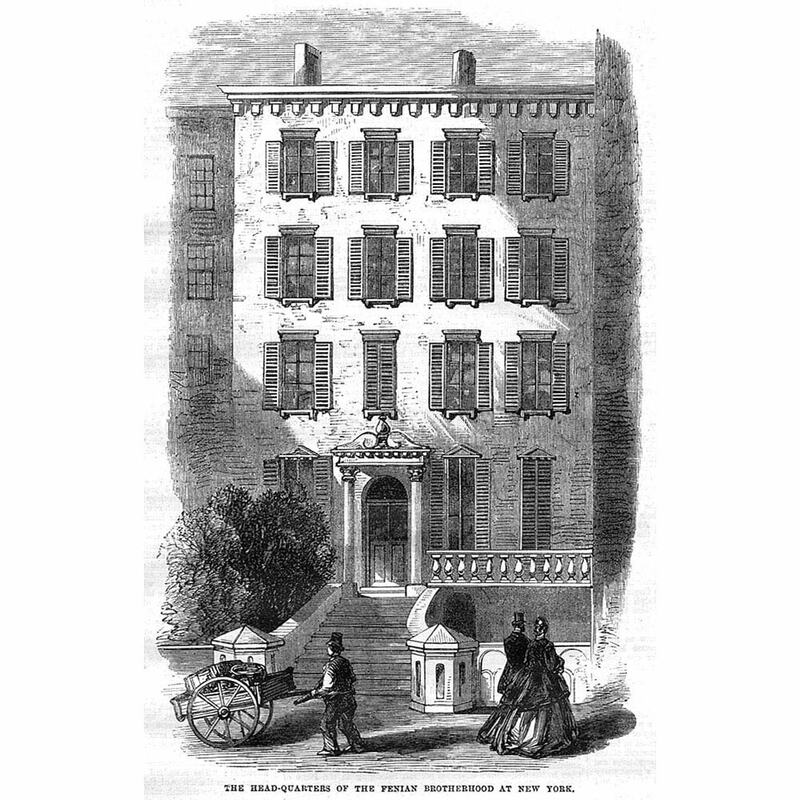 On one side was the “Executive Wing”, led by O’Mahony in the Moffat Mansion, while on the other side there was the majority “Senate Wing” under William Randall Roberts, a rival president now based in 706 Broadway, Manhattan, NYC. The latter leader, an ambitious career politician, would go on to become a member of the United States House of Representatives for the Democrat Party and a US ambassador to Chile. In contrast the scrupulously honest John F. O’Mahony would die in relative poverty. With its large population of Irish immigrants and refugees, southern Manhattan was to see much Fenian activity over the next several decades, coupled with considerable – and occasionally violent – British espionage operations. Below is a report from the New York Herald dated Saturday, November 18th 1865, describing the Fenian Brotherhood’s new home. “The Fenian Headquarters on Union Square, New York. In accordance with previous plans the officers of the General Fenian Brotherhood have transferred their headquarters in this city from the old location at 22 Duane Street to a more pretentious and proper locality. The large and costly private building, No. 32 Seventeenth Street, known as the Moffat Mansion, and situated directly at the head of Union Square, near the Everett House, has been procured for Brotherhood purposes, and yesterday possession was accordingly taken by the Fenian Executive authorities. These new quarters are altogether superior to any which the Fenian Society, or, indeed, any other society, financial, political or commercial, has ever before occupied in this country. The building has been noted as one of the most splendid family establishments in the United States. It has always been used as a private mansion, and it is only with reluctance that its owners could consent to its being let for public use. It is a five story brown stone, porticoed and cupaloed building, fifty by one hundred and sixty feet in dimensions, and railed, trimmed and decorated in the most elaborate manner. In fact, expense seemed to have been altogether overlooked in its construction, the only limit to the useful and ornamental being the limit beyond which the arts had not yet advanced. There are little gardens with plants and trees in front, and stables, servants apartments, and other out offices in the rear of the building. As there are not many state coaches or vehicles with their liveried crowds expected to be in attendance upon the present revolutionary occupants, the use of these out offices, or of the culinary and billiard regions in the basement, is not very obvious, save perhaps they be made to serve as arsenals or rooms for the examination of the rifles and blunderbusses which, according to the London Times, bristle porcupine-like round the central post of Fenianism in this city. HISTORY OF ALL THE HEADQUARTERS. All this gorgeousness does not seem to have been required, or indeed desired, by the Fenian Brotherhood for the transaction of the society’s business. But no other place could be obtained of sufficient inner capacity for the business requirements which are developing into immense magnitude and importance. In the matter of respectability, too, the Brotherhood had suffered by the comparative nooks in which business had been transacted in the infancy and weakness of the association. A room in Centre Street had for many years answered the purpose of “headquarters”; then the dignity was conferred upon the rooms in Duane Street, which have already been described in the Herald. About a year ago, when upon the enlistment of Head Centre O’Mahony, with his Fenian regiment, in the three months’ national service, the executive helm was taken by [Henry] O’Clarence McCarthy, these premises were overhauled, furnished, carpeted and made somewhat presentable for the time. Then followed the rush of development, the Cincinnati Congress, the adherence in all quarters of substantial citizens, capitalists and the business classes. The Fenian merchant, coming from a point a thousand miles away, when “purchasing his fall stock” would seek the great headquarters in high anticipation. Distance did lend charms to the view. The central office was not adequate to the status of the universal Order, and a depression went back. It was an imperative call of the progressive interests of the Fenian Association which decided that Duane should follow Centre, and thus “the citizens of European revolution” have their sentinels posted to-day. With the Green and the Stars from the cupola floating, upon the historic square of the American Union and beside the mounted statue of the world’s great revolutionist – Washington. THE APPORTIONMENT —LOCATION OF MEN AND MACHINERY. The advantages of this building are that it affords facilities for all the departments to operate the machinery in general concert. On the first floor are the financial rooms, consisting of a large bulk-like office with desks, railings, etc. where moneys are to be received, bonds disposed of, accounts kept, etc. Adjoining is a sort of vault, with safe, etc. where the more valuable office papers and books, with bonds, we suppose, are to be secured. A splendid central apartment will be used for financial negotiations, etc. Then the reception room, capacious and magnificent apartment, lays ready to receive “the proudest republican in all the land.” A library, with martial records from the famous fight at Ventry Harbor to the campaign on Grant’s line, besides tactics of war and statesmanship, diplomacy and “conspiracy,” as worked out by “red revolutionists” in all times and places; also miscellaneous works and maps from “The Last Fenian Survey of Ireland” back to the most noted records of the Sanskrit tongue, invites the studious to pass a calm hour in this “Tara of the United States,” as an original Philadelphian has denominated it. The President of the Society has his office and private room on the second floor. Another suite is allotted to the secretary of military matters. A military board of examination and a secretary of matters civil are also to operate on this floor. By 1880 the once all-powerful Fenian Brotherhood of America, and its military wing, the 19th century Irish Republican Army, was a shadow of its former self, repeatedly split apart by internal dissensions and the infiltration of British spies and double-agents into its highest ranks. At the same time the word “Fenian” had become a general term for any Irish republican grouping or individual. In North America it was soon claimed by the FBA’s new rival, the more circumspect Clann na nGael, one of the architects of the Irish Revolution of 1916-23. The Brotherhood’s Union Square headquarters, Moffat Mansion, was eventually disposed of and like most buildings in the neighbourhood it was demolished and replaced by new structures. Today the only reminder of this centre of Irish-American insurgency, at least in terms of its architectural style, is the remains of the Century Building at 33 East 17th Street, between Park Avenue South and Broadway on Union Square. Built from 1880 to 1881 it housed the Century Company, a publishers, before long decades of neglect led to its refurbishment as a Barnes & Noble bookstore. Rather more prosaically the actual location of the Moffat Mansion possibly lies somewhere beneath the neighbouring Petco’s. Great work uncovering this! Am devouring a biography of Devoy now, so as to get a grasp of Clan na Gael’s activities in the US and esp. in San Francisco. Have another interesting, though shorter, one coming up on the Fenians in New York City and they way they tied into local – and parochial – US politics.